Dr. Alan Ledford chats with some of his students before leaving for Atlanta. From the left are Josh Miller, Adam Eckert, Meghan Koch, Mellonie Hall, Ledford and Miranda Groseclose. 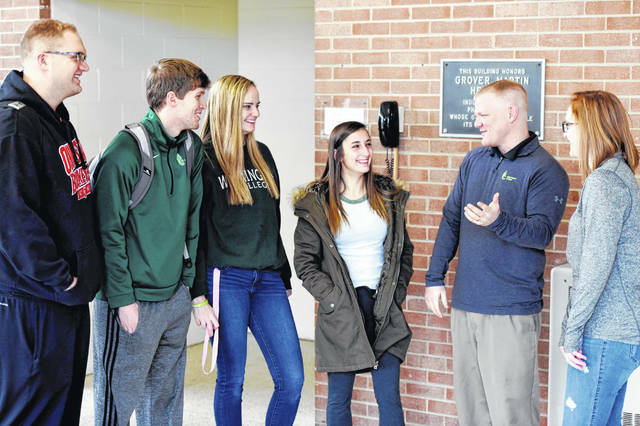 WILMINGTON — While most of America will enjoy watching the pinnacle of the country’s obsession with sports from the comfort of their homes Sunday, 31 Wilmington College students will actually be at the Super Bowl. These sport management students and their professor, Dr. Alan Ledford, left Tuesday morning for Atlanta to spend the next five days working at the nation’s biggest annual sporting event — make that event, period. As volunteers, they will serve as ambassadors, greeters and customer service staff in assisting the thousands of guests attending a myriad of events and activities associated with “The NFL Experience” during Super Bowl Week. They also will work Game Day and hope to be able to actually watch the featured event: the New England Patriots versus Los Angeles Rams. Indeed, sport management students have toured and met with officials at the Bengals’ Paul Brown Stadium; Great American Ballpark, home of the Cincinnati Reds; Fifth-Third Field, home of the minor league’s Dayton Dragons; The Columbus Crew’s Malpre Stadium; and athletics facilities throughout The Ohio State University. Also, they’ve staged events on campus while also working the NCAA Division Football Championship in California earlier this month and this month’s four-day Flyin’ to the Hoop high school basketball tournament in Dayton.